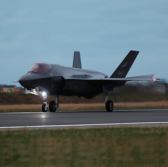 Norwegian Prime Minister Erna Solberg has said the country intends to buy additional F-35 jets from Lockheed Martin and P-8 maritime surveillance planes from Boeing, FOX Business reported Wednesday. The first three of the 52 ordered F-35 units were delivered in November 2017. A Lockheed representative said to FOX that Norway has supported the F-35 effort since developmental phases. Prime Minister Erna Solberg said that the economic relationship between the Norway and the U.S. is being strengthened, the report noted. The F-35 integrates stealth, speed and network-linking capacities to participate in modern aerial combat. The P-8 is a naval aircraft designed to perform anti-submarine warfare, reconnaissance and intelligence operations.